It was a hard fought 1-17 to 2-13 victory over Clare in Thurles on Sunday, and now Micheál Donoghue's squad will take on Limerick on Sunday week (August 19 ) in the All-Ireland final at Croke Park. It will be the first clash between the sides in a decider since 1980 when the Tribesmen famously prevailed by 2-15 to 3-9. Galway also will be appearing in successive finals for the first time since 1988, and all Galway supporters will be hoping the result goes as it did 30 years ago. Much has changed since then. In those days two wins could see you crowned as All-Ireland champions if a team was good enough; in 2018 it has taken the current Galway panel eight games to get to the final (including two replays ), which is a record. 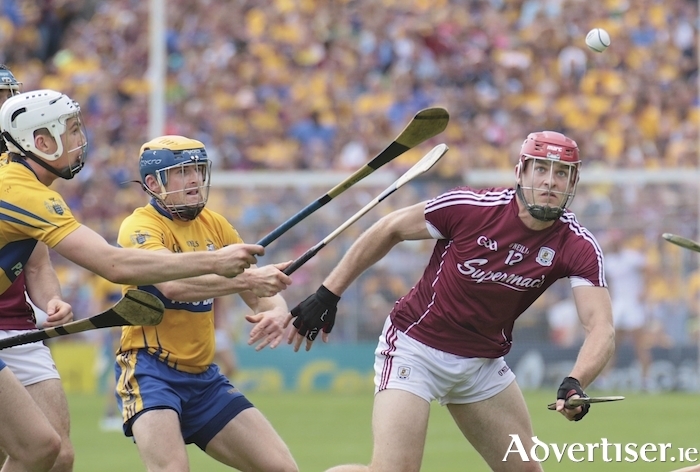 Galway were made to fight tooth and nail last Sunday, and Clare will find it hard to shake the feeling of a missed opportunity of making their first final since 2013. Again they allowed Galway to run into a big lead - nine points - after only 20 minutes - before they settled, and they will curse their high tally of wides (19 to Galway's 13 ). They had some particularly wayward efforts in the last quarter, as well as a really poor free from Peter Duggan in the second half that never reached head height. No doubt the Clare management team will be asked a good few times this week why they left it so long to bring on the influential Aron Shanagher. He only appeared after 64 minutes had elapsed and he should probably have been in earlier. He announced his arrival with a lovely point and also had a glorious chance for a goal, only to see his flicked effort rebound off the post in what was a huge moment in the game. Every Galway supporter in Semple Stadium gulped when a fine save by James Skehill rebounded into Shanagher's path, and it seemed inconceivable that he would not flick the sliotar into the unguarded net. Team manager Micheál Donoghue admitted as much himself. "I had a little palpitation all right when he got it. He is a massive player for them. He made a great start when he got the point, but I think our boys worked hard, indentified the threat, worked in numbers, and those are the fine margins.". Joe Canning really stood up and showed great leadership when needed most, hitting 0-8. Three of those were from play and his sublime sideline settled fraying Galway nerves near the finish. The Portumna man shipped a lot of punishment too, but he never flinched a challenge and came back for more even when he had taken a few hard knocks. Conor Whelan had a super game too. The Kinvara man won a good number of vital scorable frees and clipped over three sweet points. His pace and constant movement caused all sorts of problems for the Clare defence, nullifying the influence of their sweeper. Three different Clare defenders tried to curtail his influence. Pádraig Mannion continued with the superb form he has been showing all championship, and he put in a massive 75 minutes in the Galway defence. His all-round aerial ability and pace to get past Clare players was a joy to watch, and he did a super job in Gearoid McInerney's absence. Limerick will have studied Galway over the past two weeks and they will feel they can learn from Clare's tactics at different stages. In Declan Hannon, Cian Lynch, Aaron Gillane, Gearóid Hegarty, Nickie Quaid and Shane Dowling, they have some fabulous players. That said, Galway are by far the more experienced side. Many of the team will be playing in a fifth All-Ireland final if the 2012 replay is incuded. Nine of the Galway players who saw action last weekend also featured in that 2012 replay. Apart from Seamus Hickey, who is now an impact sub, no other Limerick player has been through an All-Ireland senior final. That Galway know-how, mental strength, experience, and guile to eke out a win in a tight contest, as they showed against Kilkenny in the Leinster final and against Clare last weekend, is difficult to beat. The players have two weeks to recover from their exploits over the past two weekends and hopefully Gearoid McInerney will also be fit to play a role. The more options a team has the better, and if McInerney can start, it gives the managment team more choices.